Humane Society statistics indicate most lost pets are never claimed by their owners. Learn why your search must change. will not know whether he or she has already been processed. the date your pet was lost). Our information has been carefully checked many times, from many angles; however, laws change, facilities change, numbers change, situations change. Everything you read here about the lost pet impoundment system can be verified or proven erroneous as you work to find your pet; you will find tips here on how to verify information as you learn how to accomplish a serious search. We encourage you to verify verify verify. Some information in this report is difficult to cope with and not for the faint of heart; plan for an efficient search; it can take weeks or months to find the lost. Although this document is written mostly in reference to dogs and cats, the principles can be applied to other critters as well. 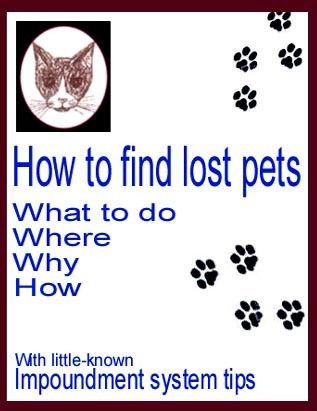 Use your best judgment regarding your particular lost pet and conduct your search accordingly. ask them to let friends, family, neighbors know about these documents. Spreading the word about how extremely difficult it can be to find a lost pet may help pet owners keep tighter control of the animals they love. This, in turn, can help cut down on the numbers of pets killed each year. 4. in some agencies, to provide additional income (as in the case of animals which are sold from an impoundment facility for research). 5. In the case of areas where pets are required to be licensed, to help keep track of numbers of pets and to hopefully identify who their owners are. B. MUNICIPALITIES. Unless otherwise mandated, each city/municipality is responsible for its own animal control. As an example of what that means, in a given metro area consisting of 5 to 10 counties and perhaps 2 million to 3 million residents, there can be well over 100 municipalities, more or less, with each deciding how stray animals will be controlled and who will do the work. For purposes of a lost pet search, no boundaries or borders have any significance whatsoever, except that such boundaries may mean more impoundment facilities, more police departments, more sanitation departments, more other places to search. C. TIMING AND DISPOSAL. Federal law requires that animals be impounded for only 5 days before euthanizing, selling, or surrendering for research. Nowadays, many shelters and impoundment agencies keep dogs and cats longer, but many cannot due to lack of space and/or lack of funding. Since lost pets can end up far from home, it's not possible to determine what might happen -- whether the pet will end up in a distant pound or shelter that keeps pets for a long period, whether the pet will end up in a facility that sells for research after 5 days, whether it will be euthanized within 7 days, or whether the pet will not end up in an agency at all. There simply are no guarantees. D. RESEARCH. Private facilities such as humane societies, some kennels, and no-kill shelters are not required to surrender for research. Government-owned facilities such as city and county pounds are required to, but some find ways to get around the requirement. Some kennels which raise animals for sale to the general public also act as municipal animal impoundment facilities. Because they would then be operating under the auspices of a government agency, they may be required under Federal law to sell for research. If so, such kennels must have a Federal license. In that event, not only are they licensed to sell those animals they specifically raise for research, but if your personal pet ends up impounded in that private kennel, he too could go for research. In addition, properly licensed individuals may sell for research. E. SYSTEM AND FACILITY COORDINATION. Most of us believe there is some kind of a system in place to help our pets and to help us in the event of a loss. We know there are state, county, and municipal ordinances, and we assume these ordinances are designed to tie everything together for the welfare of lost and found pets. We believe this, because we know there are good, functional humane shelters. We know there are good, functional animal pounds. We believe since there are such agencies out there, that they -- both similar and dissimilar agencies -- coordinate among themselves. It is true that nowadays with more understandings about how important pets are to many residents, and with better communication available via the internet, some agencies actually do coordinate. But it is still not a system-wide accomplishment. So what we end up with is a huge fragmented system full of search-and-coordinate problems for the pet owner who has lost a beloved animal. F. ANIMAL CONTROL, SHELTERS, RESEARCH. There are various types of animal-holding facilities, and there are various ways animals will get to those facilities. The majority of animals taken in by facilities are dogs and cats, but other animals may also be impounded or sheltered, such as birds, rodents, reptiles, farm animals, exotics. 1. Government impoundment facilities are animal pounds operated or controlled by some kind of government agency, such as a city or county. Such an animal impoundment facility is responsible for picking up and impounding stray animals, and normally is not involved in cruelty issues if there is a Humane Society/SPCA in the area. The government facility may have employees who are hired as animal wardens; or it might contract with a private animal warden; or the agency may contract with another facility, especially if they do not already have a building or proper space of their own. In addition to picking up and impounding strays, government impoundment facilities also accept animals from the general public. An animal brought in by someone from the general public might be owned by that person or it might be a stray. In some metro areas, some facilities will go out to pick up an animal which a resident is unable to deliver; again, such animals may be owner-animals, or they might be strays. Being government employees, police may do some animal pick-ups, as may sheriff's departments -- especially on highways and freeways, when required, and/or when authorized. If authorized, they might deliver strays -- especially injured, ill, or deceased strays -- to the municipality's facility. If the ordinance prohibits police delivery, then the police or sheriff may or may not wait at the location for the animal warden to arrive. Whether an animal arrives at the facility in good shape, ill, or deceased, it will still likely be added to an intake list. Highway departments and sanitation departments will sometimes pick up deceased pets found on streets and roadways; in this event, records are normally not kept, and the body is simply disposed of. 2. Municipality and county policies: Most municipalities, at least those in large metro areas, have some way to control stray animals, although some do not. If they do not, then it is up to the local residents to tend to ill, injured or hungry strays and/or to provide them with shelter. If an animal is found on a highway or freeway, that would be outside of the municipality's district and would be handled by the sheriff's office, if at all; if found in outlying county areas, then if any pickup of a living dog or cat is done in a non-managed area, it would normally be done by the sheriff's office. If on a Federal highway, this might be handled by State Patrol. 3. A Humane Society is different from an animal pound, in that it is typically mandated by the State to handle animal cruelty complaints as well as to accept animals into their shelter. They typically are not allowed to pick up strays, unless there is an immediate humane or animal cruelty concern. It could be that some humane shelters are licensed by a municipality for animal control, but we are not aware of any at this time. The humane agencies are often over-loaded with excess pets, and normally destroy those which cannot be adopted out. Although it is typical for a Humane SocietySPCA to adopt out animals surrendered by their owners, they are often hesitant to adopt out strays, and for good reason: With an owner animal, there is information immediately available including health, medical history, temperament, age, etc, whereas with a stray animal, none of that information is available. The stray may be pregnant, not be trust-worthy with kids, have a disease, not be housebroken, not get along with other pets, and so forth. Humane Societies are unlikely to sell for research, although they are not prevented from doing so by Federal law. 4. A private no-kill shelter is similar to a Humane Society/SPCA, but it does not euthanize adoptable animals. It will, however, euthanize animals for health reasons, or for serious issues rendering the animal un-adoptable. It also does not have authority to pick up strays nor to investigate cruelty complaints, and instead will get animals surrendered to them by the general public. If a no-kill shelter has facilities in which to house pets, it typically must be licensed. If it does not have a facility license, then it is common for them to place animals in foster homes until adoption (this type of shelter is commonly referred to as animal rescue, and is typically tied to a specific breed or type). There may be some circumstances where animal rescue must also be licensed, with or without a facility. 5. Private Kennels and Individuals. Kennels (and catteries) are normally facilities which raise animals for sale. Some are also contracted by municipalities or counties to impound stray animals. Some also raise animals for research, and have a Federal license to sell to research labs. If a private kennel acts as an impoundment facility, it has a right to sell impounded animals which are not claimed by their owners. If the kennel also is licensed to sell to research labs, the unclaimed pets may be legally sold to research labs. A kennel may hire its own animal warden, it may contract out to a private warden, it may also contract with one or more holding facilities. Individual dealers may also retain animals for resale and research. 6. Veterinary hospitals will sometimes contract to act as impoundment facilities for municipalities which do not have their own pounds. As such, they may also sell for research if licensed to do so; and they may contract out as holding facilities for private animal wardens. Impoundment laws and activities which apply to other facilities also apply to such veterinary facilities. 7. Research Labs which use animals in research typically prefer to purchase from kennels animals which have specifically been raised for research purposes, since there is a better chance of the size and temperament being acceptable. However, purchasing research dogs and cats from a kennel or cattery can be extremely expensive, so Federal law requires that government impoundment facilities surrender impounded animals to research labs which request them, which is typically much less expensive for the labs. However, this also means that lost pets which are not claimed by their owners can go for research, depending on which animal pound or shelter they may eventually end up in, if they in fact end up in a shelter or pound. Some government impoundment facilities, such as some city pounds, although mandated to sell for research, find ways to avoid doing so. Other pounds, depending on management or city ordinance, prefer to sell for research in order to acquire the additional funding from research sales. To determine who sells for research in your area, get a copy of the Federal Register for research labs and dealers by contacting your local Federal office. Which pound or shelter is the one where your pet might end up? Your efforts will pay off. Keep your search going while studying this website's information.